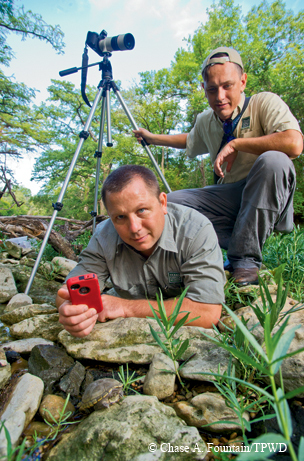 ﻿﻿Citizen scientists play a role in conservation by reporting wildlife sightings. A field herpetology course taught by University of Texas professor Travis LaDuc introduced Powell to the Herps of Texas (HOT) Project on iNaturalist. The project is an effort to map the distribution of reptiles and amphibians through crowdsourced observations. The iNaturalist platform allows people to share their photos of plants and animals, and in the process, it gives them the opportunity to learn about what they are seeing and contribute to conservation efforts. iNaturalist is the perfect tool for anyone who wants to know more about wildlife. The website allows users to post observations as well as explore other observations. In addition, the iNaturalist mobile app allows people to report sightings when they are far from a computer or even a cellphone tower. When people post an observation on iNaturalist, the program asks them for four pieces of information: who, what, when and where. These basic ingredients of an observation aid identification and allow biologists to create large, meaningful sets of data that can support conservation efforts. “Who” is the observer, the person posting the observation. “What” is the species identification. Fortunately, the platform is set up for naturalists of all skill levels, so observers don’t need to know what species it is. “If you are unsure of what species you saw, you can upload the photo, ID it as ‘frog’ or ‘bird,’ and mark it for an expert to help you,” Powell says. Once the photo appears on iNaturalist, the comments section becomes a forum where others will chime in to identify the animal. When identified, the species observation is automatically linked to the profile page where you can learn more about it. “When” is the date. Recording the date of observation is important with reptiles and amphibians, since they’re active only during certain seasons. The iNaturalist app can extract time, date and location information from data associated with smartphone pictures. “If I am pressed for time, I’ll just snap a picture of the animal, record the location and save it to add later,” Powell says. “Where” is especially valuable, as it helps biologists better understand what habitats support wild populations. The location is also essential for creating automated checklists for counties, parks and states on iNaturalist, a valuable resource for the amateur naturalist. The iNaturalist app automatically assigns the location using the phone’s GPS, or observers can mark the location using a Google map on the iNaturalist website. ﻿State herpetologist Andy Gluesenkamp (with phone) and TPWD biologist Cullen Hanks record an observation of a yellow mud turtle using iNaturalist. Harnessing the power of the crowd, iNaturalist is constantly updating the profile of each species based on new observations coming in. iNaturalist users can include additional details about the animal in the “description” tab. They can list the number of animals, the habitat in which the animal was found, the animal’s identification marks, the weather, behavior and more. These details enrich the experience of other iNaturalist users and add value to research. For example, if the animals have young, the population or the habitat may be more valuable to conservation efforts. The HOT Project on iNaturalist was started in September 2012 as an experiment, but it has exceeded the curators’ best expectations. In the first year, the project has accrued 250 members and documented more than 4,000 observations. Perhaps more significantly, the project has documented more than 200 species, which is more than 90 percent of the reptiles and amphibian species found in Texas. The success of the project has been due in large part to the high caliber of the three curators (well-respected professional herpetologists from major research and conservation institutions) who are managing the project: Toby Hibbitts, curator of amphibians and reptiles at Texas A&M University; La­Duc, assistant curator of herpetology at the University of Texas at Austin; and Andy Gluesenkamp, state herpetologist for the Texas Parks and Wildlife Department. This team has not only introduced the project to the naturalist community, but also has been very active in providing feedback on people’s observations. Every observation submitted to the HOT Project is validated by at least one of these three expert curators (in addition to the feedback from the iNaturalist community). So why are these professional herpetologists taking time to check all of these observations? One major reason is that they enjoy it. Another reason for their participation is the sense that this project could have a revolutionary impact on research and conservation for herps in Texas. While the first year has been an impressive success, it is still only scratching the surface of the power of the crowd to generate and identify observations. To understand that potential, we can look at what has been accomplished for birds with an online platform called eBird. Started in 2002 by the Cornell Lab of Ornithology and the National Audubon Society, eBird is an online bird checklist that allows birders to upload observations via smartphone or computer. By unlocking the power of the crowd, eBird has compiled more than 140 million observations of birds from around the world. In Texas alone, birders have reported more than 7.5 million observations. eBird has proven to be an invaluable resource for birders, as well as for research and conservation. Even though the data is not collected with a standardized methodology, the sheer volume of observations allows researchers to discover patterns in populations that were not detectable before. For example, although ornithologists thought there was a single population of indigo buntings in the United States, they have discovered that there are actually two populations with very different migratory strategies. 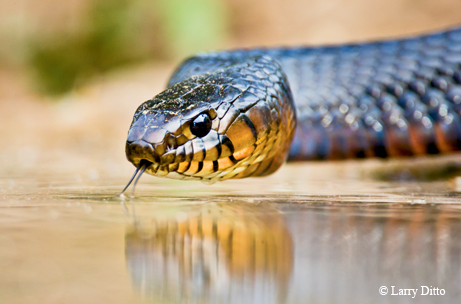 For example, the recent observation of an unknown rattlesnake posted to HOT proved to be of one of the easternmost occurrences of the ornate black-tailed rattlesnake. With enough observations, this data can be used to model the distribution of each species using geographic information systems, or GIS. These models will fine-tune range maps and highlight regions where populations were thought to exist but actually may not exist. On a finer scale, these models are helpful for identifying habitats that are essential to certain species. This will provide powerful baseline data for understanding how species could be affected by changes in habitat or climate. This is why all observations are valuable, and no species is “too common” to report. The power of the crowd will also be an important early detection system for changes in ranges and colonization events. This is especially important with non-native and potentially invasive species. 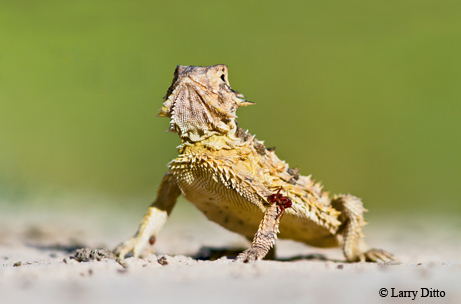 Already, the project has detected undocumented non-native species like a bearded dragon found in a Fort Worth park. In such cases, early detection can be critical to responding to the introduction of a non-native population. The project has also helped map the distribution of known non-native species like the Cuban brown anole. Should this population start to really grow, the project will detect it. Of course, any observation of a rare species is valuable. 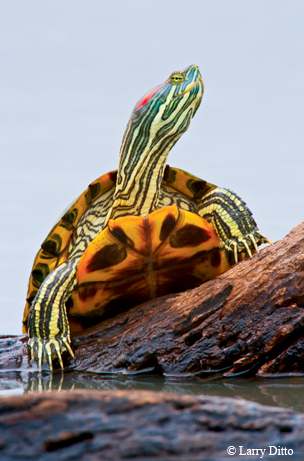 In many cases, species are thought to be rare because of a lack of information. As an example, the Texas tortoise is considered a declining species, but the HOT Project could show that it is more common than once thought. On the other hand, an observation of a truly rare species is a significant conservation opportunity. Rare species are often passed off as common species because they are not often encountered, but such an observation is likely to be recognized in the HOT Project. For example, the spot-tailed earless lizard has not been detected throughout the southern half of its range despite a concerted effort to find it. A single observation would offer an opportunity to study where the lizard is persisting and to better understand the reasons for its decline. No matter how common or rare the species, the observation is valuable. “Using iNaturalist makes me feel I am doing my part to provide information for researchers and conservationists,” Powell says.